Main Sight Tool - Now comes with the 30 degree pusher block for Glock and HK sights. A must have for Gunsmiths and Armorers. The Sight Pro uses a unique clamping shoe design, plus 4 slide support pads and a white nylon spacer block to lock the slide in place while adjusting or replacing sights. Two cuts on the lower section of the tool allow you to lock it in a bench vise. Redesigned to make it easier to swap out the pusher blocks. Shoes do not come with Sight Tool. Gunsmiths are few and far between where I live and shipping a firearm is a pain. Purchased this tool primarily for Springfield Armory firearms...especially the XDs. Regarding the XDs: The front sight should be removed out of the left side of the slide (muzzle downrange), and the rear sight will come out the right side (again, muzzle downrange); visa versa for installation. Made short, easy work of replacing the factory sights on three XDs with aftermarket night sights. Only downside is that I have four other firearm-specific pushers that are now obsolete. I have used MGW Sight pushers for a while and they were mostly adequate for the individual guns they were designed for, but this tool is the best sight pusher I've ever used. Beats the MGW individual tools and a certain $500+ Bench mounted mounted sight pusher hands down. If you change a lot of sights I strongly recommend this tool. Makes it a breeze to change sights even on the most stubborn of sights (i.e. Springfield XD). This is an awesome tool. It makes removing the XD sights easy. Left no marks on the slide or the new sights. It's a must for anyone who has to install or remove sight very often. I have used it on Sig, Glock, Springfield XD and others with great results. Well worth the money. I bought this, the 30 degree block and a few of the bases to change sights out and I am extremely happily with it! It has saved me time and money since I no longer have to make a trip to a gunsmith to change out sights. I even use it at work. It is a quality tool and I highly recommend it. Having used many different brands of sight tools over the years, I knew that after trying out MGW's Main Sight Tool for the first time, I'd never need another. If you've used earlier versions of MGW's sight tools, you'll find this one to be a quick study. Simple to use and exceptionally strong, it can easily handle even the most stubborn sights, ( XD, XDm, XDS ) without damaging anything on the pistol's slide. It's especially perfect for gunsmiths. Our shop has been using it for a couple of months now and there hasn't been a job yet that it couldn't readily handle. A wide variety of slide shoes available at very low cost allows this tool to hold pretty much any contemporary semi-auto slide out there today. The adjustment settings allow for a perfect and snug fit for each slide while it's held in place, without scratching or marking it. 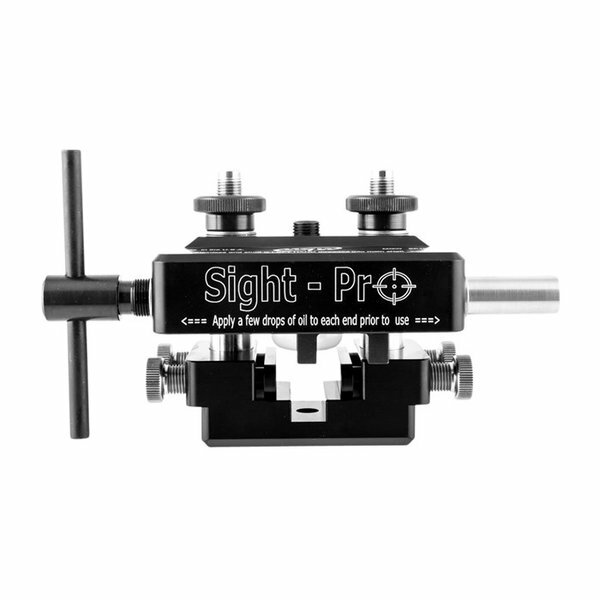 Removing, installing, adjusting.. this sight tool does it all and does it perfectly! I was using another sight tool to take off a XD-S front and rear sight and it cracked (broke). Not the sight the tool broke. âWowâ Yes the XDâs sights are very stubborn and hard to take off even if you use a brass punch and a hammer, you would probably damage the sight and or the slide or both. With this Universal Sight Pro Tool you would not have any problems, It would take it off like butter. And whats lovely about it is the tool may be a little in the high price range for some people but itâs well worth it. As a gunsmith Iâll make my money back in no time. Also donât need so many different sight tools for every firearms in the market just need to buy the boot for that firearm and its cheeper and less space on the wall or tool box. First time out and I have a problem. The white plastic elevation adjustment block is too tall to allow me to get down to remove the factory sights. Had to machine about 1/8 inch off it to get at the sight base. Also, the lock down knobs/nuts have no lead-in, so getting them started on the posts is subject to fumbling. I dropped mine twice! I machined a tapered lead and all's much better now. Unfortunately the threads are some odd extra-fine metric pitch, so cleaning up burrs & chips with a common tap is not possible. Minor thing. These knobs/nuts go on quick & easy upside down, though! Very well engineered otherwise, though a bit difficult to get an eye on what one is doing. Way better than the cheap-o special I had before. The tool is built like a tank. If you use it as directed (watch the video on youtube) you will not damage your sights or the pistol on which you are installing or removing them. I too had the issue of the knob (which DOES protect your pistol's slide top) keeping the arms too high but 5 minutes of sanding (remove the white knob and the two washers that serve as a bearing surface for the thumb screw) the BASE of the knob and everything works exactly like it should on the Valor slide with low novak sight cuts. Do not mill or sand the bearing surface (that which rests on your slide) of the knob! The base can be reduced and no one is the wiser once you've reinstalled it! George was very patient and instructive and I appreciate his customer service skills. I am glad I didn't try a lesser model/make of sight tool. Pay once, cry once! You will not be sorry. Hands down the finest universal sight tool. Much more expensive than the other options, but if you are changing sights often you will get over that instantly. They say "pay me now or pay me later." Don't waste your money on the others. Buy just one. And this is the one. No marring, easily adjustable and professional results. I had to wait a while to get the tool and all the required extra parts but it was worthwhile. It is very solidly made and provides a secure base for working on slides. I had to get the additional 30 degree pusher and the HK slide clamp since my first change was to put Dead Ringer Snake Eyes sights on an HK VP9. All this came to about $450. And there is additional expense for other pistols - extra cost and possible out-of-stock downsides. The original sights came off slick as can be and installing the front sight was easy. I ran into a problem installing the rear sight though. The pusher engaged the sight ring which is offset from the dovetail by about 0.3 inches. It looked like the resulting torque was going to either break the sight or mess up the installation. There was not enough flexibility with the tool to directly engage the slim dovetail. So I had to finish with a drift punch using the bottom part of the tool to hold the slide. It turned out fine and my old eyes really like the ring sight better. If I had to do this a lot, I would drill a hole in the bottom of the pusher to install a pin to engage the dovetail directly. Bottom line, this is an expensive tool but works well and my son will appreciate it when he gets it. Ok, Ive tried them all. They all have some pro's and a lot of cons. But this tool is just to easy to use. The fit and finish is of a high end professional tool. It's the engineering that makes this tool very easy to setup and use. Don't waste any money on anything else. If you plan to put on or adjust more than one sight, bite the bullet and get this tool. Ive tried, Glock's, 1911's, Springfields XD and Sig's. All were super easy to do, and a pain of a job is now just fun. I've used this tool to change the sights on Glocks, 1911's, XDS, and SW Shields. This pusher is simple to use and does not leave any mars on the slide. I once tried to get away with a brass drift and a hammer to remove the front sight on my Shield. It wasn't pretty. Invest in this tool and you won't be disappointed. After talking with MGW, I ordered this model because it is the only one that would work for front and rear sights on my 5" M&P Pro. The tool is much heavier and larger than I ever would have expected. Its a beast! Simple to use and worked like a charm. I am pretty sure that the unit I received had been previously used, as it had grease smeared across it in several locations, and the slide support pads had been installed even though the instructions state that they would come disassembled. Not the end of the world as the item still worked as intended, but I wonder if someone used it and returned it to save the 300. Love this thing! When you pick it up, it is apparent how well built it is. Buy once, cry once! This thing is great. It was a breeze changing the sights on my Glock 43 using this tool. I can't recommend it enough. The tool looks complicated at first, but once you watch the YouTube videos posted by the manufacturer, it becomes very easy to understand. Works with just about any semi auto ever made. The main tool may be a little pricey, but when compared with what you would pay for one-off sight pushers that only work with one make of gun (that you might never use again), this tool is a no-brainer, because with this you are buying one tool that can work with all your guns. The tool worked like a charm with my first job on a SIG P320. Itâs extremely well designed and engineered to help prevent all the common problems often encountered with changing sights. Because itâs a large and robust universal tool, itâs somewhat cumbersome to operate by holding it in hand, but it can be clamped into a vise if desired. I was concerned that all the screws and knobs would make it fiddly to set up and use, but after watching MGWâs video and a little practice, things went smoothly. My only complaint was that finding the proper video was a little tricky and MGWâs home is evidently only through a social media site which is a nuisance for people not interested in becoming members there (and thatâs a lot of us). Brownells should either host the video or at least provide a link. This is a great tool to have in the box. Instructions are clear. Tool is easy to use, and performed the job perfectly! Great tool for replacing sights on many pistols. I bought this tool and have had no problems with it. It does everything that they advertise. About a month ago, I decided I wanted to upgrade my front sights on both of my M&Ps and also adjust all four of my pistols for exact centering. I figured this would entail a lot of trips to my lgs, so I opted for this wonderful device. When you pay for quality, you know the difference the first time you use it. I had to watch the video to fully understand the operation. But I've used it now 4 times and it is one of the most rock-solid tools I own. Someone at that company has a lot of engineering smarts! Simple to use, a bit of an investment but worth it to be able to take care of my sights without relying on someone else. So far I've used it on a P320, shield and G17 and it worked perfectly for each one. This is one of the most well made tools I have ever purchased. Excellent design. Easy to learn to use. VERY VERSATILE. The pistol specific shoes are about $18. I am not a professional gunsmith but this can certainly allow you to install sights professionally. bought this to install sights on my Sig 226 and it worked flawlessly! I have since used this on a glock with equally good results. Great instructions, Great product! This sight press does a great job at moving or removing sights and installing them. An adapter or a shoe as it is called is needed for the specific gun that is being worked to hold it securely in place. Once the top slide is locked in you can easily remove the sights. I must admit the Sig sights are held in tight but the Sight pro did remove them with some effort. Overall I am happy with the purchase, I also bought almost all the shoes and wished that they sold a complete set at a discount should the buyer wished to do so. I bought a Universal carry case from another website to hold the press and a small tack bx for the shoes. Thanks MGW for the quality tool !! This sight installation and removal tool is a BEAST. Very robust and well made. It is expensive but IMO, worth every penny. Wish I had started out with this tool and saved myself a bunch of headaches! I love this thing finally a pusher that can handle the hard stuff like Kahr & XD. The one thing I wish it had was a single blade adapter to push on the mos sight bases. Outside of that it is worth every penny especially when you work on as many different types of pistols as I do. In the long run this is actually the cheapest way to go if you need to work on several brands of firearms. This thing has never even bogged down like others. Even if I have to use a cheater bar (which is rarely) this has never scratched a frame. WHAT A TIME SAVER, THANKS BROWNELLS! Bought several inserts so as to be able to deal with multiple pistols. Was impossible to remove sight on XDs - had to take to a shop. Need to move rear sight on Colt 9mm 1911 Commander and the tool just could not budge the sight - yes, set-screw was removed from the sight and lots of oil used. The 1911 insert (105) needs to be about 1 mm taller so that pusher can get better purchase on the sight. The tool is built-like-a-tank. However, after applying max torque by hand I did not wish to add length to pusher's rod for fear that threads would be damaged. I do not understand why I am 2 for 2 failures with this expensive, apparently well designed, tool. Very easy to figure out how to use this. It comes with a detailed CD that explains all you need to know. It really is built like a tank. I have tried less expensive ones and I'm glad I found this jewel! If you want a sight tool, get this one. You really do get what you pay for. This thing is worth every bit I paid! It's heavy duty and grabs the slide tighter than any sight pusher I have ever used !!! As a shooter and hobbyist gunsmith, machinist and metal fabricator, I'm very impressed with the quality and versatility of this tool. If you anticipate only ever changing sights on one gun and don't want to spend the money, you might rather buy the MGW model-specific tool but if you have several different guns to work on, and can afford to buy the Sight Pro, the purchase will be money well spent. This thing is heavy duty and precision made. Compared to the Glock rear sight tool, well there is no comparison, but Glock sights come right out though so it doesn't need to be beefy... This definitely seems like a tool that will out last the user. Watch the MGW video on YouTube to get a quick overview on how to use it. BTW, I don't usually write reviews, but this is a really great product and I felt compelled by how well it worked. I purchased this sight-push over a year ago along with a lot of the needed shoes, I would recommend this as a must have for a gunsmith shop! I have found this tool to be quite useful and works exceptionally well with all of the different sights I have had to swap out for customers. Very little to no marring on the sights when finished. After receiving and assembling, reading the instructions completely, I attempted to remove the rear sight from my Colt Government model 1091. It did not move at all, in either direction. I would have needed to use a cheater bar on the T handle to continue, and the instructions are specific not to ever use, instead use a hammer and punch. The tool is very well made and instructions are accurate for assembly and operations, but I cannot speak as to whether or not the tool actually works. This tool, with the appropriate attachments, make removing and installing sights on a pistol about as easy as the job can be. The build quality is top notch, and should last a few lifetimes with proper care. Just received the product and I am quite impressed with the build quality. Everything is nicely machined and finished. Screws and threads are heavy duty and smooth. Product comes with additional accessories - a separate sight pusher for sights that have 30 degree slanted sides that can be easily swapped out; it also comes with plastic spacers designed to go between the slide clamps and your slide to prevent damage to your slide. The rig is also designed to be used with a bench vise, but a vise is not necessary to use the product. Product is easy to use and comes with concise instructions; there is also an excellent YouTube video that clearly explains use of the product. The up front cost may not be worth it if you only need it for one brand of handgun, but if you need to change out or adjust sights for multiple brands, this product is a far better value than purchasing separate sight tools for each brand. MGW sells brand specific slide shoes that fit into this tool; they cost about $20 each. Overall very impressed with the product. The night I received it, I had a front sight on my Beretta PX4 adjusted in a matter of minutes. Highly recommend to anyone who needs a single tool for multiple handgun brands. Valmistajan tuotenumero: MGWSP1000 Tärkeimmistä näköpiirissä Tool - nyt tulee 30 asteen työntämiseen lohkoon Glock ja HK nähtävyyksiä. On Gunsmiths ja Armorers. Näky Pro käyttää ainutlaatuinen puristusosin kenkäsuunnittelua plus 4 Liu'uta tukea tyynyt ja valkoista nailonia KOROTUSPALA lukita dian paikallaan kun säätäminen tai vaihdat nähtävyyksiä. Leikkausviillot alaosasta työkalu voit lukita se penkki penkki. Helpompi vaihtaa pois työntämiseen lohkojen uudelleen. Kengät eivät tule näkyville työkalu.